If sites like "Armchair Empire" and "Gamekult" had rated the game just a teensy bit higher, Obsidian would have walked away with a financial bonus for its work on New Vegas. Deals between game publishers and developers are just as varied as one might find in any other production business, though the details that comprise them often never come to light. In the case of Fallout: New Vegas, the community recently got some rare insight from Chris Avellone, the co-owner of Obsidian, as to the nature of their arrangement with publisher Bethesda. According to a recent Tweet, his company's work on the post-apocalyptic RPG was to be a one-time payment unless the game garnered a positive response on review aggregator Metacritic. 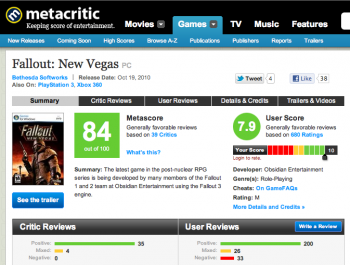 "[Fallout: New Vegas] was a straight payment, no royalties, only a bonus if we got an 85+ on Metacritic, which we didn't," Avellone wrote. If you're a fan of New Vegas, or of people getting paid well for hard work, this admission is made more poignantly gloomy by the fact that it reached an 84, just one point away from the extra compensation. The bonus was likely a big deal for Obsidian, considering that the developer doesn't see one cent on a per sale basis. Avellone's disclosure comes just one day after the reported wave of Obsidian staff layoffs, said to include over thirty people, some of who were reportedly just hired between one and seven days before the sweep. The firings came joined with the news that the studio had cancelled development on a next-gen project (codenamed "North Carolina") and its continued progress on the recently announced South Park RPG remains unclear.